My dive buddy approaches a flamboyant cuttlefish (&quot;Pfeffer's Flamboyant Cuttlefish,&quot; <em>Metasepia pfefferi</em>) on the sandy bottom of the Lembeh Strait. 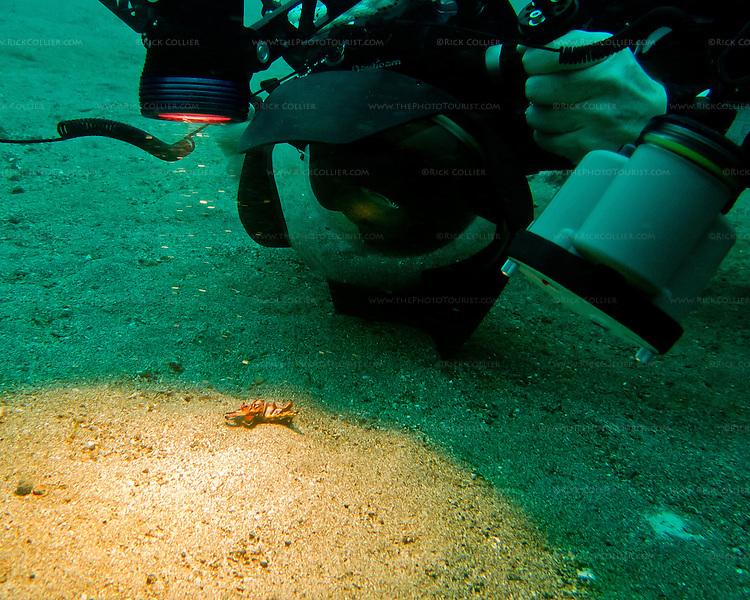 The cuttlefish is that tiny little lump, surrounded and dwarfed by camera lens, lights and strobes. We came across a number of flamboyant cuttlefish in the sand along the bottom of the Lembeh Strait. This is a very small beastie; the ones we saw were between two and four inches (say, about 5 to 10 cm) long, including tentacles. Normally its coloration is very drab -- dull shades of brown, looking like a rock on the sandy bottom where it lives, &quot;walking&quot; around the bottom using its lower arms (tentacles). But it adopts bright, almost pulsating shades of red, purple, and pink with that distinctive yellow border when disturbed (for instance, by a hulking diver shoving a large camera lens into its &quot;face&quot;).